African safari wildlife park, be there with wild animals! This is it! You're in an African safari wildlife park, sitted in one of those safari 4x4 and after 30 minutes looking for lions, on the right, a lion is lying next to a springbok carcass, his stomach full of food! I have experienced many game reserves in South Africa and most of them with the Big Five and it's always an amazing experience! Each time you see something different and each time you think it was better than last time but I wish all my clients could go to one of the very very very special place: Tswalu . This is one of the best experience I have ever had in South Africa. This is a true dream! Sipping a cup of tea with a few snacks in a comfortable couch at the Execujet airport. It's amazing how suddenly it becomes pleasant to wait for your flight! The two hours flight felt like half an hour! Time flies in a cosy plane from which can admire the view of incredible red hills, savannahs and mountains. 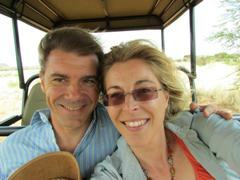 My husband and I sitting alone in our Land Rover (with a big smile on our faces as you can see! )with our private guide and tracker admiring the beauty surrounding us with yellow, green and red landscapes. I have been a few times to the Kahalari so I expected to see more desert type of landscape...not such a variety of scenery. 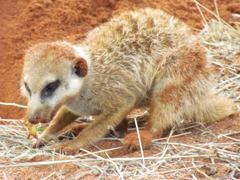 Walking to the meerkats and get so close to them that you almost feel you are part of them except that you are not made to eat scorpions like they do (!). It’s impressive to watch them digging frenetically to get crunchy scorpions and eat them with the same energy (as per picture on the right)! 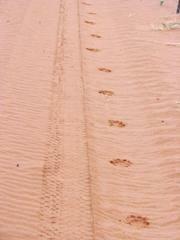 Tracking the true Kalahari black mane lion, who shares his kingdom with the majestic cheetah and leopards; looking for them for one hour to find an alley of footprint first then go and circle to finally see, right in front of us, 2 lionesses and 3 (big! )cubs; following them 20 meters away, in their own environment, for 45min through the bush with the 4x4- this is truly unique! 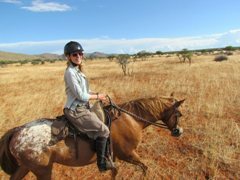 Horse-riding alongside giraffes in the wild to feel one with nature, observing wildlife and encountering a rare aardwolf! That part of the reserve does not have lions or any dangerous animal! 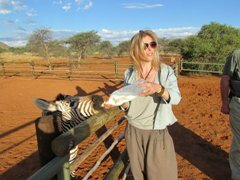 Touching an orphan zebra with the tip of my fingers because he would not allow me to get too close to me, wondering what type of animal I am! 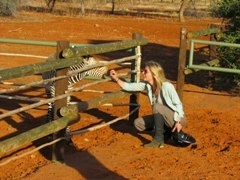 Feeding him with a baby bottle and feeling that not a long time ago he was a wild zebra with no mum and that he would have been killed by lions, made this moment even more special! Enjoying a glass of wine on a red dune overlooking the sun downer colouring the savannah in a intense red colour and feeling spoilt with a natural bracelet made of grass, on the spot, from Jo, our awesome guide! Holding a millipede in my hand, first rolled like a spiral and observing it unrolling and feeling at the same time the thousands legs walking over my arm! I can assure you that on the list of what to do before you die, after your stay at Tswalu, you’ll be able to tick a rather important amount of experiences! Regardless of the weather, you'll feel that you are at the right place and the right time! Should I mention that accommodation, restaurant and the service are obviously outstanding?! Also, one important aspect, Tswalu is a malaria free location. One advise before you go, don’t forget your camera because your personal internal ‘hard-drive’ won’t be big enough to remember all details you’ll experience but this is definitely something you want to cherish for the rest of your life! It will boost your ‘down’ moments! When Is The Best Time to Go to African Safari wildlife park? The best time is during the dry season for the following reasons. - Game must go to permanent water supplies to drink, mostly in the mornings and evenings which increases your chances of seeing game. - Trees don't have so many leaves, the grass is low and the bush is generally thinner. One can then look deeper in thereby also increasing ones chances of viewing game. In the Western Cape including Cape Town, the best time would then be the summer months (from November to March) as winter tends to be rainy. 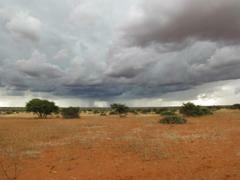 In the Kalahari and the Kruger Park, the best time is usually in the dry winter months from May to August. The climate is comfortable during the day and the temperatures drop at nights which ensure you a good night sleep! National or Private Game Reserves? 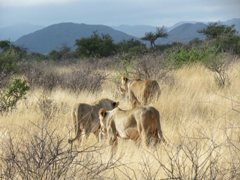 In South Africa, you have the choice to go to National or private game reserves. 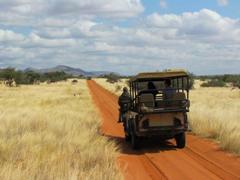 The National game reserves are usually bigger and you can combine your own driving with game drives. 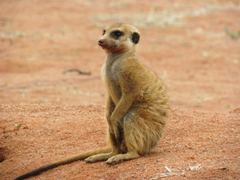 The private game reserves are smaller which can help to see more animals. It's more luxurious with less people and they offer better services. You will be doing game drives with rangers and trackers in open vehicle. Game drives are a memorable experience! For a few hours (it varies between 2 to 4 hours depending on the reserve), you are looking for animals with the help of the ranger and the radio contact with other vehicles to alert each other of good animal sightings. Rangers give you as much information as you want to know! Don't hesitate to ask them plenty of questions! It's passionating! When animals are seen, the ranger gets as close as possible to them but they always keep a certain distance to avoid disturbing them. Halfway way through, most of the time, a tea or a coffee is offered in the bush, for sunrise (if you go for the early morning game drive) or for sundown (if you go for the late game drive). If you have children, I would advise you to rather go to National game reserves to be able to drive with your own vehicle because 2 or 4 hours can be very long for children. And most of the reserves don't allow kids under 5 years for game drives. - Whilst self-driving you are not allowed to go off-road. - Don't forget that you are surrounded by wild animals so stay in the car to take pictures. - Stretch your legs in rest camps or designated rest areas only. - Toilet facilities are only available in rest camps and certain designated areas. 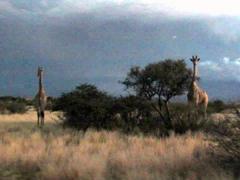 - It can be pretty cool even cold during game drives so remember to bring a warm jacket with. 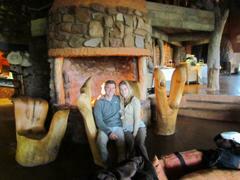 Sometimes and especially in private game reserves, they offer covers to keep you warm. Now, you're ready to go...! 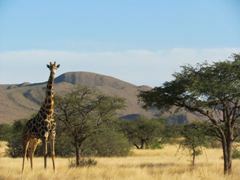 I have selected a few African safari wildlife parks which offer something special. First, the wildlife reserves close to Cape Town...are malaria free areas! Yeaaaahhh! No need for malaria tablet! 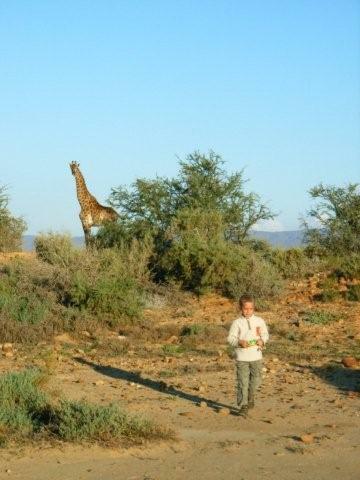 Inverdoorn private game reserve (2h30 from Cape Town) You would be able to walk with the giraffes! I have done it, it's amazing! Thomas, our little boy, was a few meters away from them! 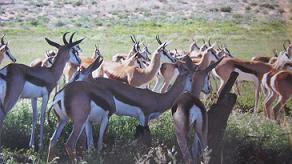 Inverdoorn is a nice small private reserve, very well organised. They propose early game drives and late ones as it's the best time to see animals. During the day, relax at the swimming pool, observe the turtles and just enjoy life! The meals are always lovely and the atmosphere simply great. The game drives are in an open vehicle with other clients. You have probably heard of the 'Big Five' – lion, leopard, buffalo, rhino and elephant? 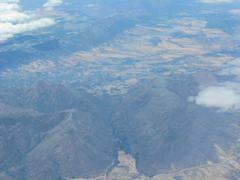 Well, there is another private reserve... Sanbona (3h30 from Cape Town) which has them all! They also have beautiful white lions. They even offer hot air ballooning! J'adore le Kalahari! There are two ways to explore it, either you do it yourself by car which is more an adventure, lots of fun and excitement and less expensive or you go to a private reserve which is more relaxing, luxurious and you'll get to know loads of information about wildlife thanks to the rangers which take you on game drives. If you decide to do it by yourself, you'll have to drive from Cape Town to the Kalahari Gemsbok National park. It will take you around 10 hours drive. Therefore, I advise you to stop on the way to Augrabies Falls National park which is really worth it and you'll be able to see baboons! 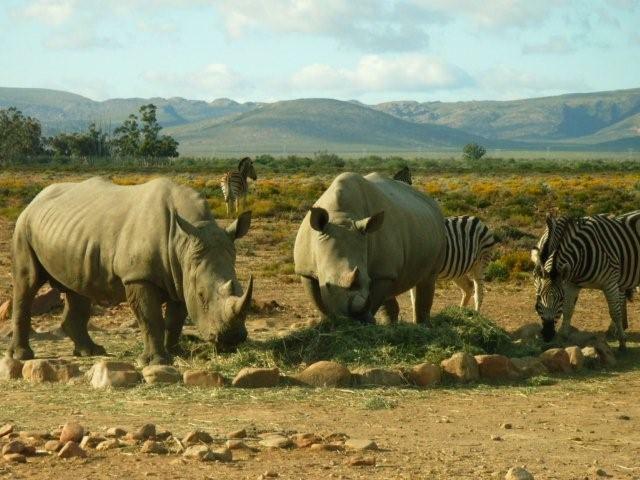 Then after this visit, you can go to the Kalahari Gemsbok Park , my favourite African safari wildlife park when it comes to track animals in your own vehicle... With my sedan car, I have explored this park during 3 days and I'll never forget it! The landscapes of this park are so wild and beautiful! 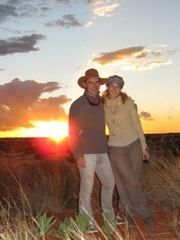 Between the red dunes and the dry river bed, you are definitely in Africa! For more information on lion, click here. Now if you arrive in Johannesburg, you could drive to the most well known African safari wildlife park (but not my favourite), the Kruger National Park, then it's also a nice option to see lots of animals! However, there is malaria and you should consider taking malaria tablets (I recommend Malarone which have less side effects). I like Lower Sabie for accommodation. I've slept in the self catering chalets which were very nice. There is a restaurant to eat out or a shop to make your own meals. If you would like to book at the Kruger, click on Wild Wings Safaris. 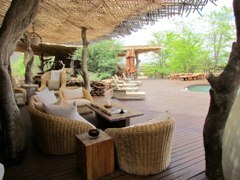 They offer luxury and budget safaris to the Kruger National Park and surrounding private game lodges. Members of SATSA. To visit this African safari wildlife park, it's nice to combine your own driving with some game drives with professional Sanparks rangers. I suggest you also book the 'braai' (barbecue) in the wild, it's an unique experience that you won't forget! 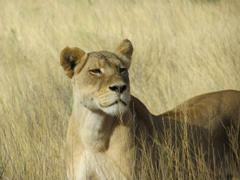 An easy way to organise a safari is to deal with a tour operator such as Lark tours. Have you experience a safari? Share your story! Do you have a great story about a safari that you did? 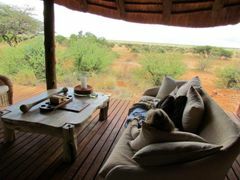 or you had an amazing time in a game reserve? Share it and include a photo if you have one!